Hong Kong-based blockchain consultancy, CryptBLK, which was spun off from the government-backed Applied Science Research Technology Institute (ASTRI), has been blazing a trail in the enterprise blockchain space. It has been working on several key projects with partners such as HSBC (trade finance), and Hong Kong Federation of Insurers (auto insurance) in implementing blockchain in helping automate and digitize their workflow systems. Blockchain Asset Review caught up with the founder and chief executive Dr. Duncan Wong, a trained cryptographer, to discuss some latest developments. BAR: What is the latest development on HSBC’s trade finance platform Voltron? How is the trade finance eco-system evolving? Wong: I believe you are referring to project Voltron, which is founded by 8 banks: Bangkok Bank, BNP Paribas, CTBC, HSBC, ING, Natwest, SEB and Standard Chartered. We are the technical delivery partner of project Voltron. CryptoBLK has supported the pilot run of Bangkok Bank recently and congratulates the bank’s successful completion of live transaction in February. BAR: What are some key projects CyptoBLK is working on? Wong: We have been focusing ourselves on supporting the onboarding of our Hong Kong insurers to MIDAS, the DLT-based real-time vehicle insurance authentication system jointly developed with the Hong Kong Federation of Insurers. This has been going very well in addition to our continuous development and devotion to Voltron, the letter-of-credit trade finance DLT platform founded by eight global banks. In addition to MIDAS and Voltron, CryptoBLK is developing an end-to-end supply chain finance platform, ATLAS and an asset valuation solution, TOPAZ. ATLAS utilizes DLT to facilitate document transfer, integration with third-party systems such as carriers, and automatically executed, digitally signed transactions. While TOPAZ is designed to streamline the communication processes and connect financial institutions surveying service providers for facilitating the industry’s digital transformation. CryptoBLK is also developing a cross-DLT monitoring system which can provide real-time healthiness scanning and inspection across multiple consortium Blockchain applications, keeping users on top of the issues before they turn into problems. BAR: What are some latest developments in your work with Hong Kong Federation of Insurers? CryptoBLK was appointed by Hong Kong Federation of Insurers (HKFI) in the development and operation of MIDAS which aims at tackling the motor insurance fraud in Hong Kong. The official launch of MIDAS in December 2018 symbolizes a significant milestone in the digitization of the Hong Kong insurance industry. MIDAS allows different user types to carry out real-time authentication with full traceability without sharing or revealing any personally identifiable information among insurers, sub-agents, policyholders and government agencies through the application of DLT and keyed cryptographic hash transformation technology. As of February 28, there are 22 motor insurers, which represent a total of about 75% of the motor insurance market written premium in 2017 have participated in the MIDAS platform. BAR: Your view of the mainstream adoption of enterprise blockchain? 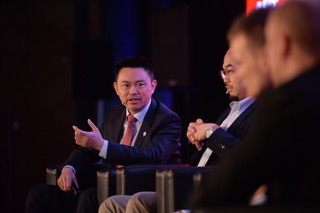 Wong: Enterprise blockchain has been seeing progress on various industries which include but not limited to trade finance, supply chain, clearing and settlement, digital asset and insurance. To use trade finance as an example, a number of consortia have been established. They are paving a promising future towards digitizing the trade finance industry. We believe there is no doubt that mainstream adoption would happen the near future.